With a name like "satanic leaf-tailed gecko," this must be one mean lizard, right? Actually, this rare reptile is a docile creature with some remarkable traits. Consider these five fascinating facts about satanic leaf-tailed geckos, and see if you agree. As you likely guessed from its name, this lizard looks like a leaf. The satanic leaf-tailed gecko is mottled brown in color, the same shade as the decaying leaves in its natural environment. This gecko's body is curved like the edge of a leaf, and its skin is marked with lines that mimic a leaf's veins. But the most remarkable accessory in the leaf-tailed gecko's disguise is undoubtedly its tail. The lizard's tail is not only shaped and colored like a leaf, but it also bears notches and imperfections to resemble insect damage. The satanic leaf-tailed gecko doesn't rely on passive camouflage to protect itself, though. It also behaves like a leaf when resting. How does one behave like a leaf, exactly? The gecko sleeps with its body flattened against a tree trunk or branch, head down and leafy tail up. If needed, it twists its body to accentuate the leaf-like edges and help it blend in. Madagascar, a large island nation just off the southeast coast of Africa, is well known for its unique wildlife. Madagascar's forests are home to lemurs and fossas and hissing cockroaches, in addition to being the only known habitat of the world's satanic leaf-tailed geckos. Though currently listed as a species of least concern by the International Union for Conservation of Nature and Natural Resources, this unusual lizard may soon be at risk. 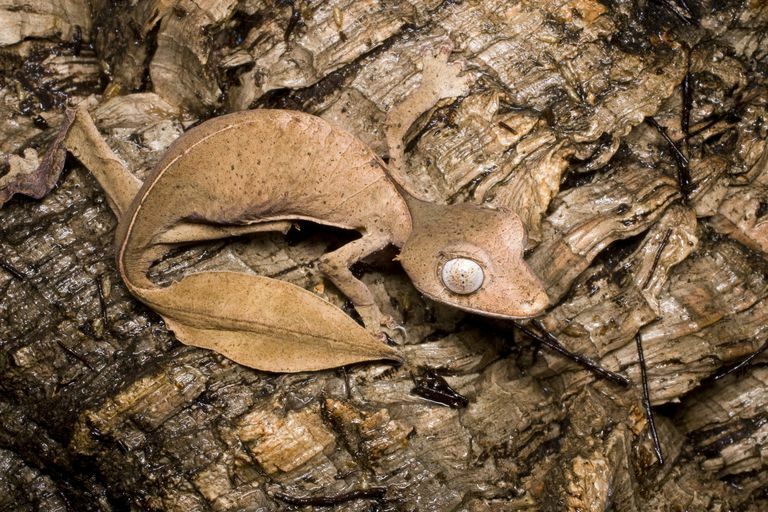 The satanic leaf-tailed gecko is picky about where it lives, and Madagascar's forests are being degraded at an alarming rate. Exotic pet enthusiasts also create a high demand for collecting and exporting the species, which is currently illegal but may continue in low numbers. That sounds rather terrifying, doesn't it? But truly, there's nothing to be afraid of when it comes to this clever creature. The satanic leaf-tailed gecko rests all day, but as soon as the sun sets, it's on the prowl for a meal. Its large, lidless eyes are made for spotting prey in the darkness. Like other lizards, this gecko is believed to feed on anything it can catch and fit in its mouth, from crickets to spiders. Little research has been done on satanic leaf-tailed geckos in their native environment, though, so we can't know for sure what else they consume. In their native Madagascar, the start of the rainy season also marks the beginning of the gecko breeding season. When sexually mature, the male satanic leaf-tailed gecko has a bulge at the base of its tail, while the female does not. The female is oviparous, meaning she lays eggs and the young complete development outside of her body. The mother gecko lays her clutch, a pair of spherical eggs, in the leaf litter on the ground, or within dead leaves on a plant. This enables the young to remain hidden when they emerge. As silly as this may sound, misinformation about this lizard went viral in 2013, leading gullible internet users to portray the satanic leaf-tailed gecko as the devil in reptile form. It is true that some individuals of this species sport large red eyes and projections that resemble horns, features which give them a decidedly devilish look. And when disturbed, the satanic leaf-tailed gecko may stand up and hiss loudly, while staring at the offender with its big red eyes. But an altered image of the gecko, complete with blood red dragon wings, sent a wave of panic through cyberspace with comments suggesting the lizard is a "real life dragon!" In truth, the satanic leaf-tailed gecko is a mild-mannered creature that prefers peaceful naps in the forest. 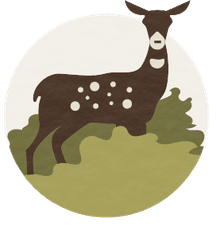 "Uroplatus phantasticus," The IUCN Red List of Threatened Species website. Accessed online November 28, 2017. "Uroplatus phantasticus, Satanic Leaf-tailed Gecko," ARKive website. Accessed online November 28, 2017. "Absurd Creature of the Week: Satanic Leaf-Tailed Gecko Wears the World's Most Unbelievable Camo," by Matt Simon, July 25, 2014, WIRED. Accessed online November 28, 2017. "Satanic Lead-Tailed Gecko. It's Like a Real Life Dragon?," Snopes website. Accessed online November 28, 2017. "Spot the lizard: The Satanic Leaf-Tailed Gecko that has a truly devilish disguise," by Philip Case, October 14, 2009, DailyMail website. Accessed online November 28, 2017.